Do you have a minute to spare to learn some English? 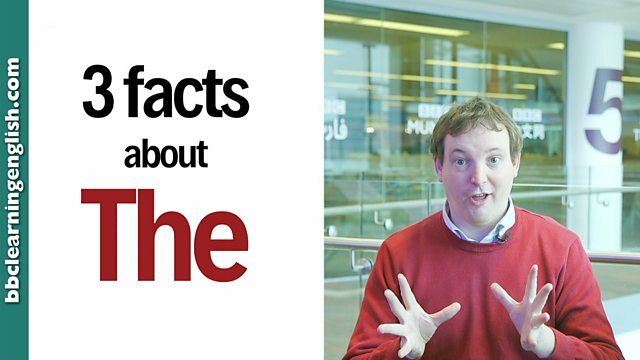 Phil is the right man to explain three facts about the word 'the'! Give us 60 seconds and we'll give you the English! Hi I'm Phil from BBC Learning English. I'm going to tell you three facts about the. We use the when referring to a specific thing and both you and the person you're talking to know which one you mean. Please pass me the milk. We can see the bottle so we know it's that one. Number 2. We don't use the when talking about something in general. For example, I love chocolate. Number 3. We don't use the when it doesn't matter which thing we're talking about. We usually use a or an, here. Give me a cup of tea, I don't care which cup, any cup will do. We use the when referring to a specific thing and both you and the person you're talking to know which one you mean. Please pass me the milk - we can see the bottle so we know it's that one. Don't use the when talking about something in general. For example I love chocolate. We don't use the when it doesn't matter which thing we're talking about. We usually use a or an here. Give me a cup of tea, I don't care which cup, any cup will do. Do both people in the conversation know which dog they are referring to? 'the', 'a' or nothing? "See that black one over there? That's ______ dog that bit me." Are we talking about chess in general? 'the', 'a' or nothing? "I hate ______ chess. It's so boring." Does it matter which one we're talking about? 'the', 'a' or nothing? "Can I have ______ chip, please? They look delicious."